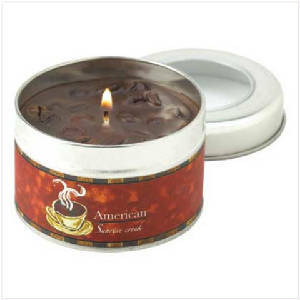 Start your day with the robust aroma of a classic cup of American brew... if you love coffee, this gourmet candle was created just for you! 35 hours of burn time. Weight 0.3 lb. Paraffin wax in tin container. 3" diameter x 2" high. Wake up with the wonderful aroma of a fresh, frothy cappuccino... without the caffeine jitters! Our gourmet candle lets you enhance any surrounding with this luscious eye-opening scent. 3.2 oz. 35 hours of burn time. Weight 0.3 lb. Paraffin wax in tin container. 3" diameter x 2" high.